Acute inflammation is a healthy response to acute injuries because it helps the healing process, but chronic inflammation in your body may increase your risk for conditions such as heart disease, arthritis and diabetes. Levels of C-reactive protein, or CRP, serum amyloid A, or SAA, and other immune system responses can indicate your levels of inflammation. Your diet affects inflammation, and peanut butter can be part of an anti-inflammatory diet. A diet high in monounsaturated fats may be anti-inflammatory, and peanut butter is a rich source, with nearly 8 grams of monounsaturated fat in each 2-tablespoon serving. 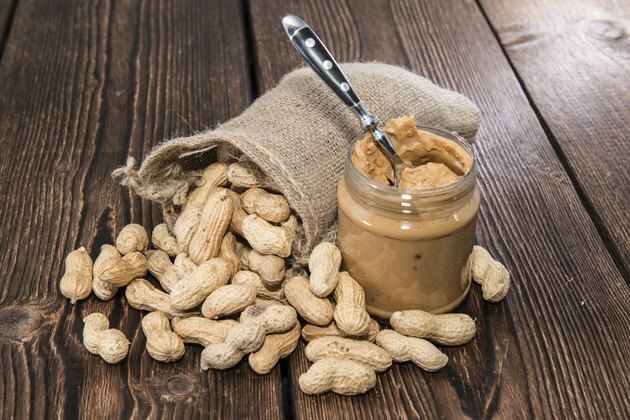 Peanut butter provides 4.5 grams polyunsaturated fats per serving that may also lower your inflammation, according to the Linus Pauling Institute Micronutrient Information Center. Peanut butter is cholesterol-free and low in saturated fat, and reducing your intake of dietary cholesterol and saturated fat may lower your levels of CRP and SAA. A diet that emphasizes low-glycemic foods may reduce chronic inflammation, and peanut butter has a low glycemic index. The glycemic index of a food with carbohydrates indicates the potential for that food to spike your blood sugar levels, and a high-glycemic diet may increase your levels of C-reactive protein, according to the Linus Pauling Institute Micronutrient Information Center. Choose peanut butter with no added sugars to lower the glycemic index of your peanut butter even further. A 2-tablespoon serving of peanut butter provides 49 milligrams of magnesium, or 12 percent of the daily value. Magnesium is also in nuts, whole grains and beans, and an anti-inflammatory diet is rich in this essential mineral, according to the Linus Pauling Institute Micronutrient Information Center. Peanut butter provides 0.17 milligrams of vitamin B-6, or about 8 percent of the daily value for this vitamin that may reduce your risk for heart disease and arthritis. Another anti-inflammatory nutrient in peanut butter is vitamin E, a fat-soluble vitamin that is also in nuts and vegetable oils. An anti-inflammatory diet provides an appropriate number of calories to help you achieve or maintain a healthy weight because obesity increases inflammation, according to the Linus Pauling Institute Micronutrient Information Center. Peanut butter provides 188 calories per 2-tablespoon serving, so eat it only in moderation to avoid unwanted weight gain. Peanut butter does not provide all of the essential nutrients in a balanced anti-inflammatory diet, which is rich in fruits and vegetables for vitamin C and phytonutrients, and includes omega-3 fats, such as from fish.